Plus five new ways to use it. Are you ready to take your Sriracha obsession to the next level? Follow the simple step-by-step instructions in this video to whip up your own homemade sauce. Then check out these five healthy, creative ways to use it—from a honey-chile-ginger grilled chicken salad to a frozen Bloody Mary. And feel free to go heavy on the spicy stuff. 1. Combine honey and next 3 ingredients (through oil) in a medium bowl. 2. With a mallet, pound chicken breast pieces between 2 sheets of wax paper or plastic wrap until very thin; transfer to a medium dish. Spoon 2-3 tablespoons of chile dressing over the chicken; coat well. 3. Heat a grill pan, grill, or broiler. Lightly coat grill pan, if using, with cooking spray. Sprinkle chicken with salt; grill until cooked through (2-3 minutes per side). Transfer chicken to a cutting board. Continue until all of the chicken is cooked, coating grill with cooking spray as needed. 4. Grill corn until tender (about 5 minutes), brushing lightly with chile dressing while grilling; transfer to a large platter. 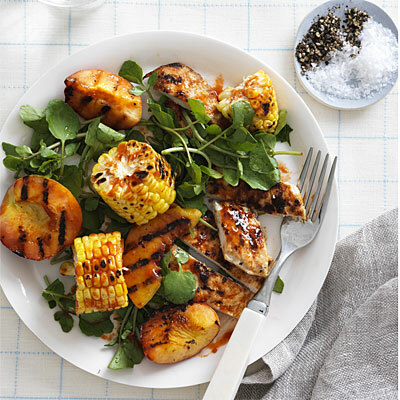 Grill the peach quarters, just until grill marks appear (about 1 minute per side), brushing lightly with chile dressing while grilling and coating grill as needed; transfer to the platter. 5. Scatter the watercress over the platter. Slice the chicken into smaller pieces; transfer to the platter. Combine cooked juices and remaining chile dressing; stir well. Drizzle over salad as desired; serve. 1. When you buy salmon, ask fishmonger to remove skin and package it up for you. Cut salmon flesh into 4 pieces and rub with ½ tsp. sesame oil. Season with salt and pepper. Let stand at room temperature for 20 minutes. 2. Preheat oven to 400°F. Line a small baking sheet with foil and lightly grease foil. Place salmon skin scale-side up in a single layer on baking sheet (cut in half to fit, if needed); rub with ½ tsp. sesame oil. Sprinkle with sesame seeds and season with a pinch of salt. Roast until skin is crispy and golden, about 15 minutes. Transfer salmon skin to a paper towel-lined plate to drain. Cut crosswise into baconlike strips. 3. Preheat broiler. Brush bread with olive oil; broil until lightly browned, 45 to 60 seconds per side. In a bowl, mix mayonnaise with Sriracha, lemon juice and remaining sesame oil. 4. Preheat a grill pan over medium-high heat. Grill salmon, turning once, until just cooked through, 5 to 6 minutes. Transfer to a paper towel-lined plate and pat dry. 5. Arrange bread on a cutting board and spread with Sriracha mayonnaise. 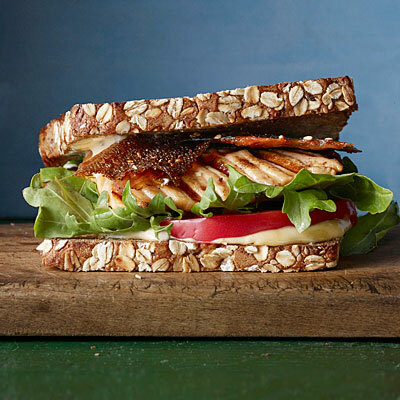 On 4 slices, arrange tomatoes, pickles, salmon, arugula and salmon-skin bacon. Close sandwiches and serve right away. Combine vinegar, sugar, and salt in saucepan; bring to boil over medium-high heat. Stir to dissolve sugar (1 minute); let stand until cool (20–30 minutes). Add carrot and radish. Let stand until vegetables pickle (15 minutes); strain and discard liquid. In bowl, mix Sriracha and mayonnaise. Slice half of avocado; set aside. Spread rest of avocado on half of toasted baguette. On remaining half baguette, spread mayo mixture. 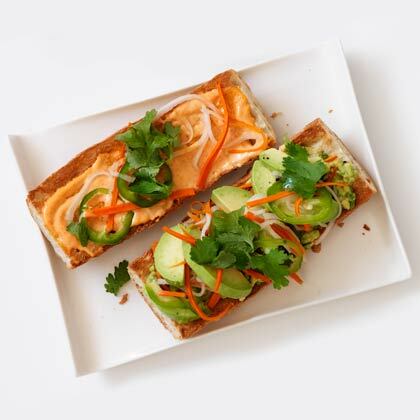 Fill sandwich with avocado slices, pickled vegetables, sliced jalapeño, and cilantro leaves. Cut into 3 pieces. 1. Place chicken, 3 tablespoons lime juice, 2 tablespoons soy sauce, and curry powder in a zip-top bag. Seal bag and refrigerate 1 hour. 2. Whisk together remaining lime juice and soy sauce with peanut butter and next 3 ingredients. Set aside. 3. Arrange rack in the center of the oven and preheat broiler to high. 4. Remove chicken from marinade; discard marinade. 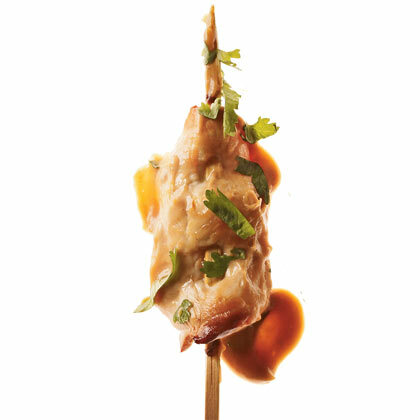 Thread chicken on skewers; arrange on baking sheet. 5. Broil chicken 4–5 minutes, until cooked through. Sprinkle with cilantro; serve with dipping sauce. 1. Spread tomatoes and cucumber on a rimmed baking sheet and freeze until just frozen, about 45 minutes. 2. In a food processor, mix frozen vegetables, tomato juice, lemon juice, Sriracha, Worcestershire sauce, and salt. Pulse until mixture is a fine slush, scraping down sides of bowl a few times if necessary. If pieces are too frozen to process, leave mixture to thaw at room temperature for 5 minutes and try again. 3. Add vodka or gin to food processor and pulse once to mix. Divide mixture between 2 glasses. 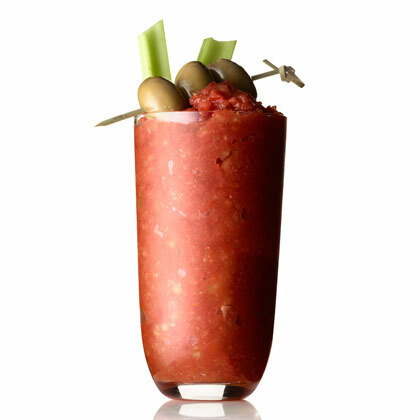 Garnish with olives and celery and serve with straws, if desired.